More good news about plants for prevention and treatment of disease. A recent study published in the Journal of Biomedicine and Biotechnology has shown ginger to inhibit growth of breast cancer cells, while simultaneously not prohibiting the growth of health cells nearby. As we know, this behavior is not typical of conventional cancer treatments and it’s one of the reasons this research is exciting. Ginger treatment suppressed the proliferation and colony formation in breast cancer cell lines, MCF-7 and MDA-MB-231. Meanwhile, it did not significantly affect viability of nontumorigenic normal mammary epithelial cell line (MCF-10A). Treatment of MCF-7 and MDA-MB-231 with ginger resulted in sequences of events marked by apoptosis, accompanied by loss of cell viability, chromatin condensation, DNA fragmentation, activation of caspase 3, and cleavage of poly(ADP-ribose) polymerase. 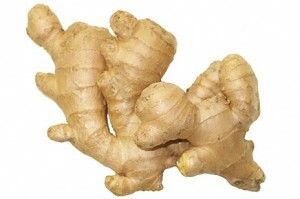 These findings suggest that the ginger may be a promising candidate for the treatment of breast carcinomas. No Need To Wait For More Studies. Juice Ginger Now! Of course more studies are coming. More universities and researchers will be looking into these new findings and expanding on them. In the mean time the rest of us have the ability to use this information right now, every day when we make juice with our Jay Kordich PowerGrind Pro juicer by simply adding 1/4 to 1/2 inch slice of fresh ginger root to whatever juice combo we are making. Don’t own your own juice machine? Grate some fresh ginger root into your salads and over that nice piece of grilled salmon you might be enjoying in tonight’s dinner. There is no need to wait for more research. Enjoy the benefits of these health giving plants right now! Check out the video below with Linda Kordich as she makes a very tasty smoothie recipe that uses ginger and also Jay’s Complete Protein powder. We call it The Gingerbread Cookie Smoothie.